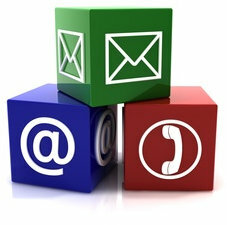 Please use the contact / enrolment form provided by us for booking your language course / programme. Your travel booking with mackdonald language academy Ltd, Ireland (herein after referred to as mackdonald language academy) - as the tour operator will be binding for us as soon as you have received written confirmation of your enrolment. As a rule, you will receive confirmation within the shortest time possible. English summer camps & adult language courses: a deposit of €300,- Euro is due within two weeks after receipt of your booking; the remainder is due three weeks prior to your arrival to Ireland. Irish High school programme: a deposit of €600,- Euro is due after we have enrolled you in an Irish high school and you have confirmed your admission; the remainder is due four weeks prior to your arrival to Ireland. Student groups: a deposit of 20% is due within two weeks after receipt of your booking; the remainder is due two weeks prior to your arrival to Ireland. Payment can be made by Bank Transfer, PayPal or Pay-to-Study (more info here). The deposit is subtracted from the amount of the final payment. Please transfer both payments either to our bank account at AIB in Kilkenny, Ireland (exact bank details will be stated in your invoice) or to our PayPal account at payment(at)mackdonald(dot)com. 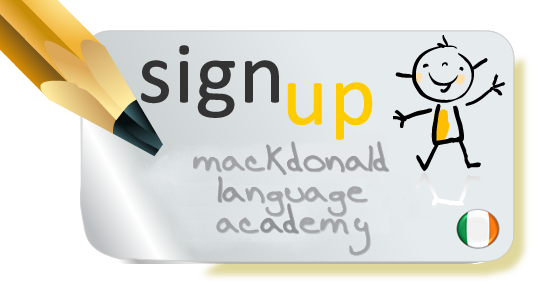 When a customer defaults on payment of either the deposit or outstanding balance according to previous agreement of payment deadlines and notification of late payment, mackdonald language academy is entitled to rescind the contract and claim compensation for failure to fulfil obligations. You will receive informational materials and travel documents approximately three weeks before your stay in Ireland. These include details about the language school, an itinerary and respective accommodation (host family, hotel, residential accommodation etc.) addresses. On national holidays of the respective country, classes will not be held and there will be no compensation for instructions hours lost. Please enquire for the exact dates of national holidays. This applies to our adult courses only. There is no public holiday during our Junior summer camps (June - August). Contractually declared services are quoted on our website and specifically the price lists as well as the hereupon referenced information in the written confirmation of enrolment. The information contained in the catalogue is binding for mackdonald language academy as it constitutes the basis of the travel contract. The contractual legal obligation for payment of damages, which does not include bodily harm, is limited up to three times of travel price as long as damages of client was neither caused deliberately nor roughly negligently by the organizer. If individual performances are simply mediated than Mackdonald Language Academy will only be liable for lawful mediation of performances and not for the performance contribution by itself. All considerable claims against the organizer on the basis of default must be asserted within one month of the contractually intended completion of the language course. In the interest of the customer this should be performed in writing. After this deadline the participant's claims will only be considered valid if he was unable to adhere to this time limit independent of negligence. For course / programme cancellations up to 21 days or less prior to the start, the paid fees are reimbursed minus an administration fee of €300,- Euro (junior and adult language course) / €600,- Euro (high school programme). Once the course / programme has started, no refund is granted for cancellations or premature withdrawal from the course / programme. The contractual liability for compensation of damages (not including bodily injury) is limited to the amount of three times the value of the language tour as long as the damage to the customer was neither premeditated nor negligent on the part of the organizer. 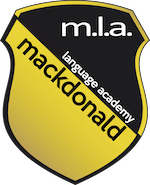 If particular services are mediated, mackdonald language academy is only responsible for the mediation of these services and not for the service provision itself. 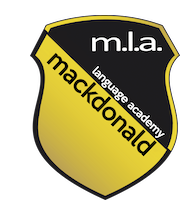 By accepting mackdonald language academy's terms and conditions, the student accepts that the school can freely use all photography, film and sound material that has been created by mackdonald language academy and its staff during the course, without asking for further approval from the student. As a non-EU national, you might require a visa to come to Ireland. You will require a "letter of invitation" in order to apply for the Irish visa. It is a legal requirement that all course fees incl. accommodation and tuition are paid in full before this letter is issued. Once you have paid the full amount, we will send you the "letter of invitation” which confirms that you have been accepted for the course and paid the full course price. The letter of invitation is to be submitted along with the other documentation when applying for the visa. If you are refused a study visa you will get a full refund of all money paid less € 300,- to cover our administration costs.